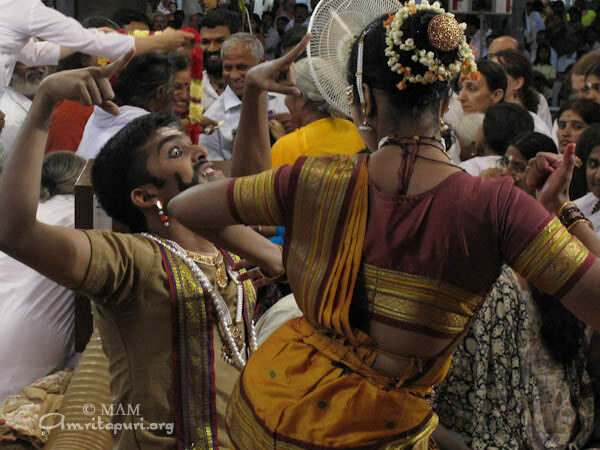 Pune was once known ‘Punya nagari,’ the meritorious city. 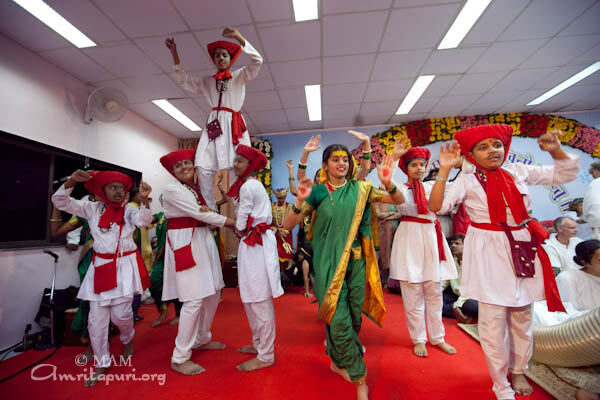 Over time, it became shortened to just Pune. 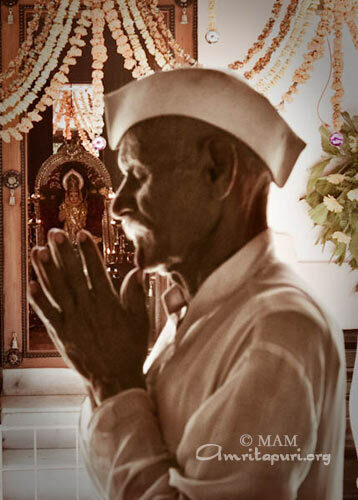 Maharashtra is known as the land of saints, which include Jnanesvar, Tukaram, Eknath, and Namdev. 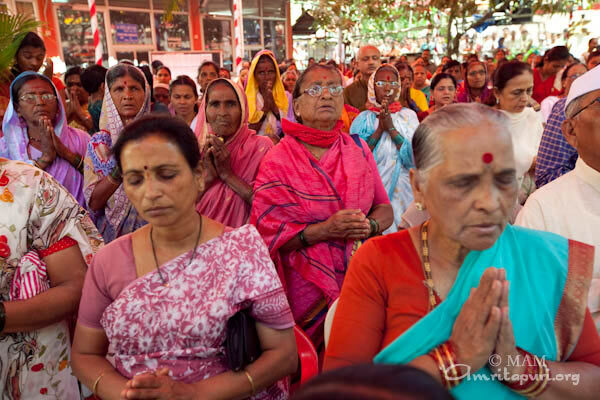 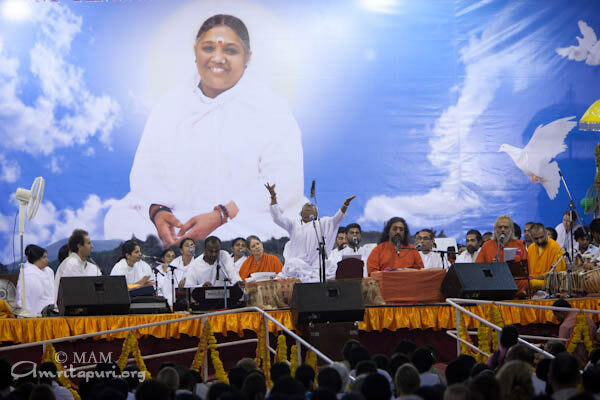 Amma’s ashram is only a twenty minute drive from the samadhi shrine of the great saint Jnanesvar, who spread the message of the Gita in the native Marathi language. 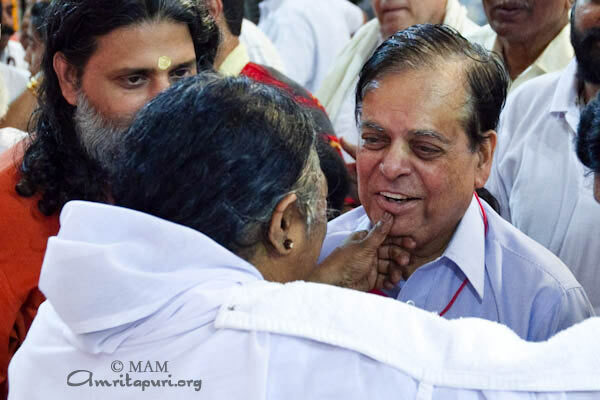 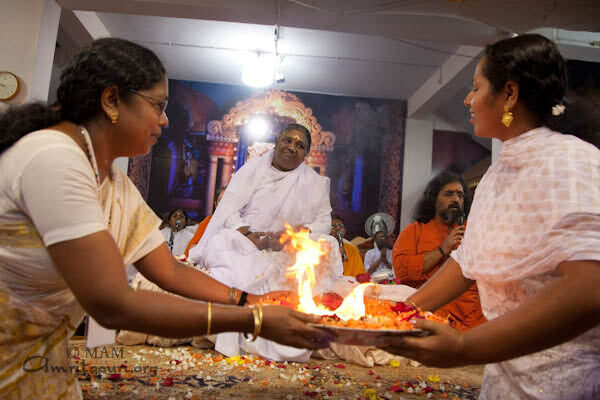 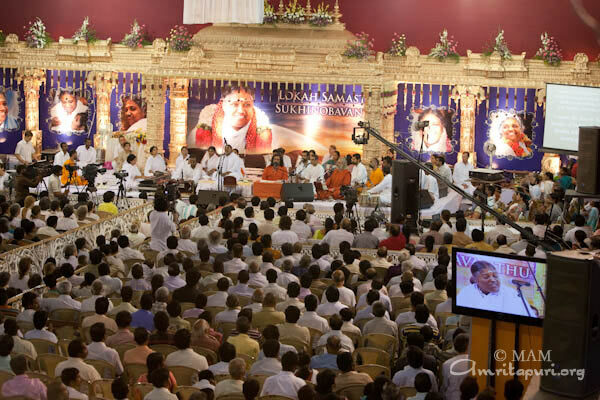 In these two days of programs, Amma is also spreading the eternal message of Sanatana Dharma. 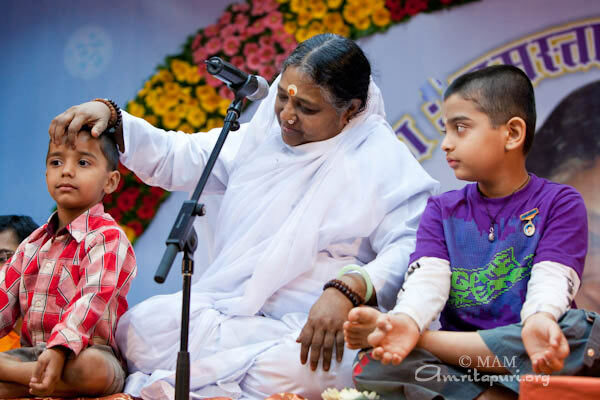 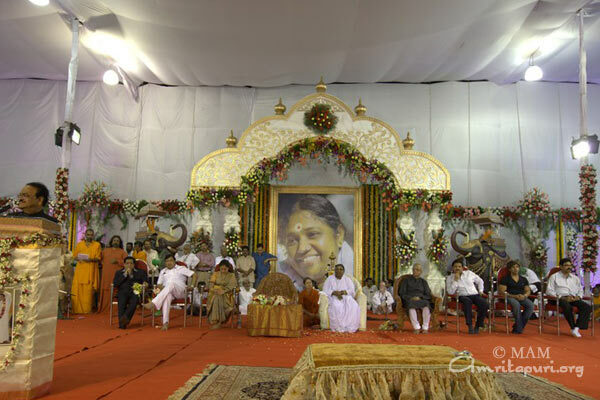 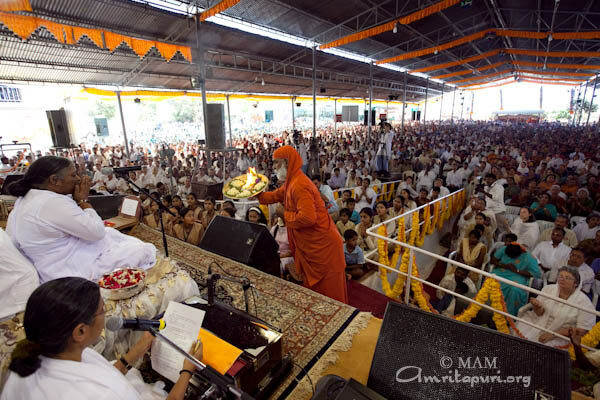 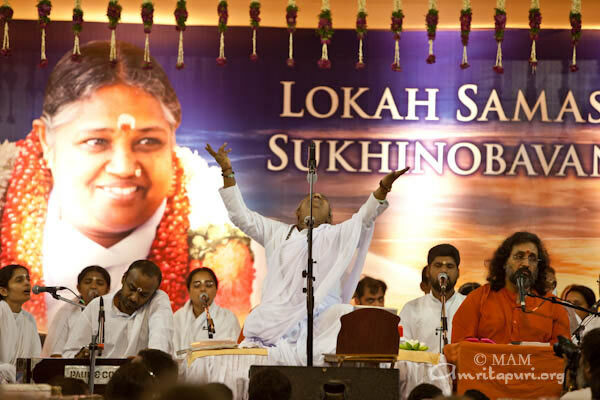 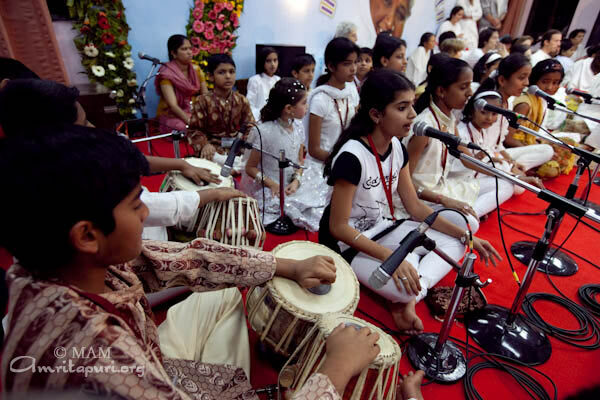 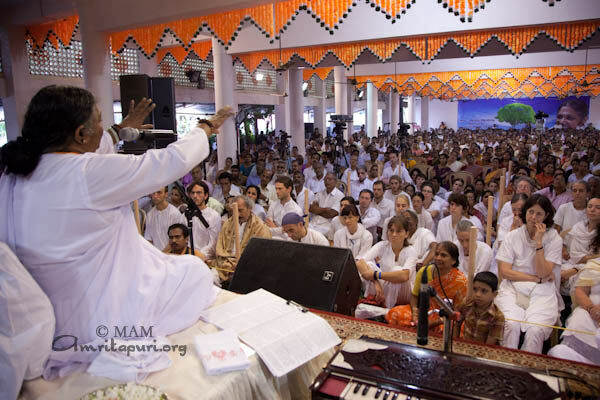 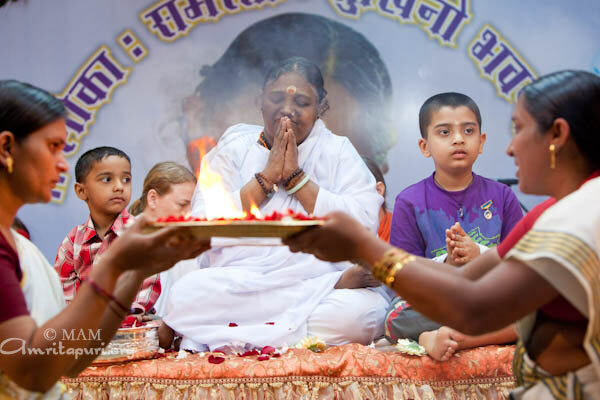 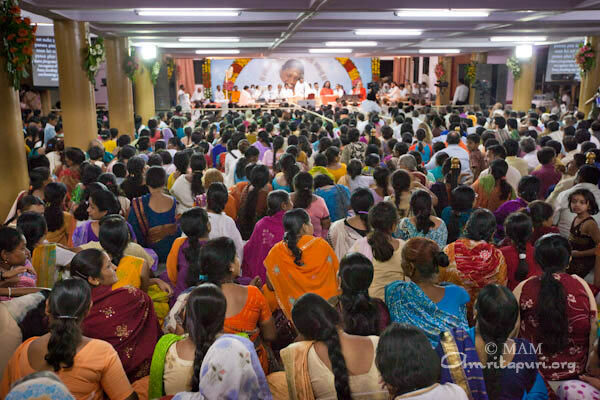 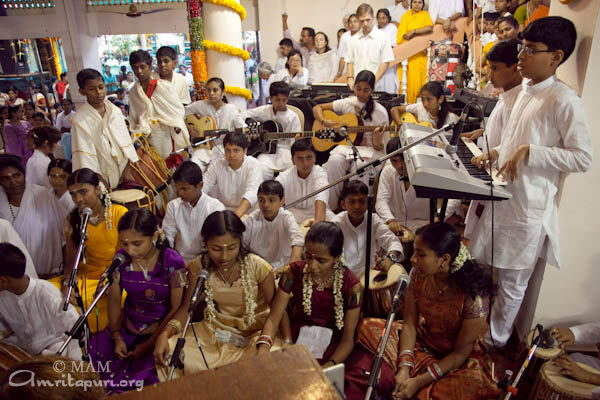 During the programs Amma sang many new bhajans in Marathi, and Amma’s satsangs were translated into Hindi. 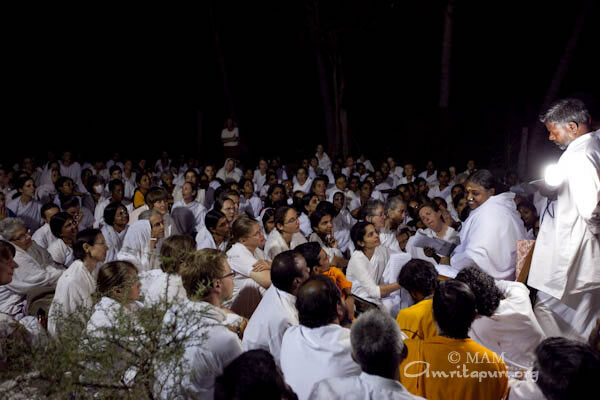 On the last night, Amma spoke about the importance of dispassion in one’s daily life. 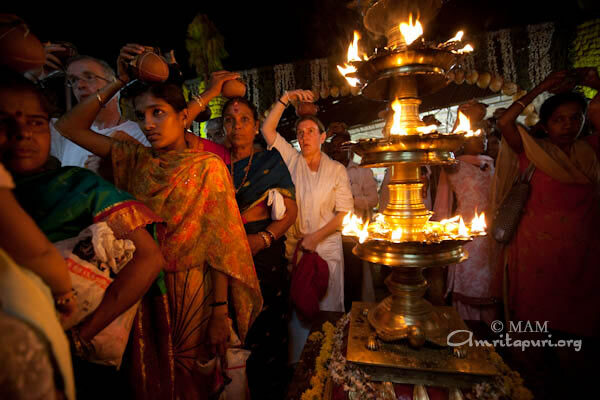 The temperature during the day was scorching hot, while the nights were cool. 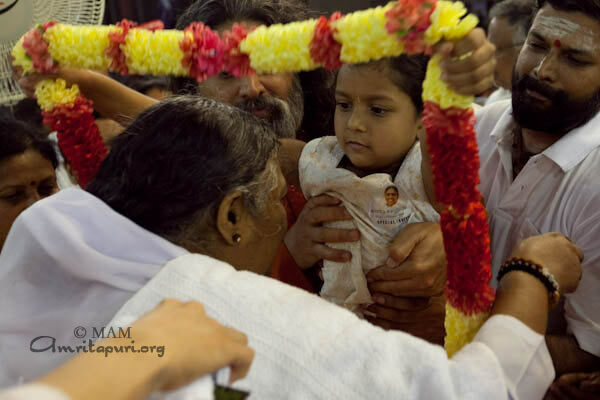 People came for Amma’s darshan from all flocks of life; from villagers to vice-chancellors of universities. 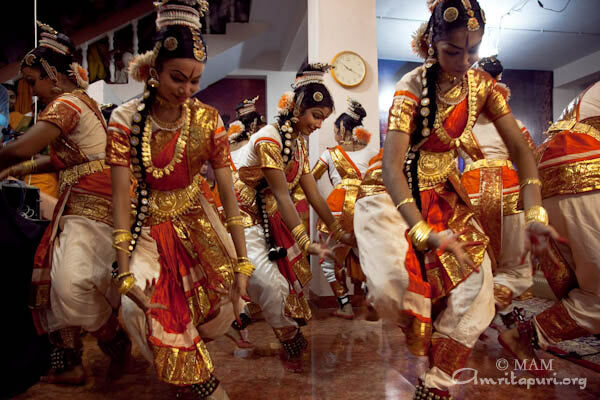 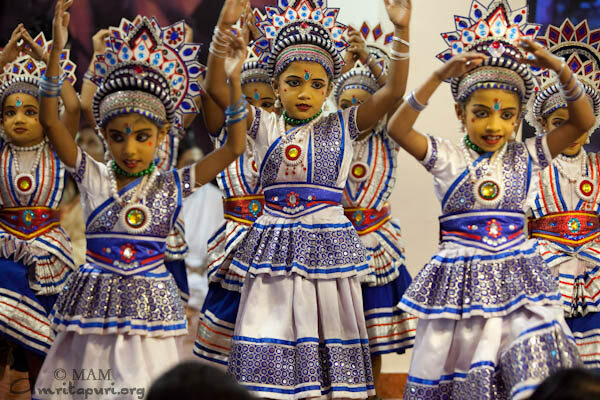 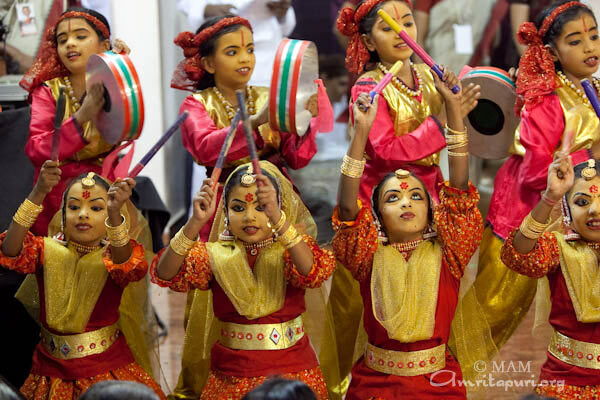 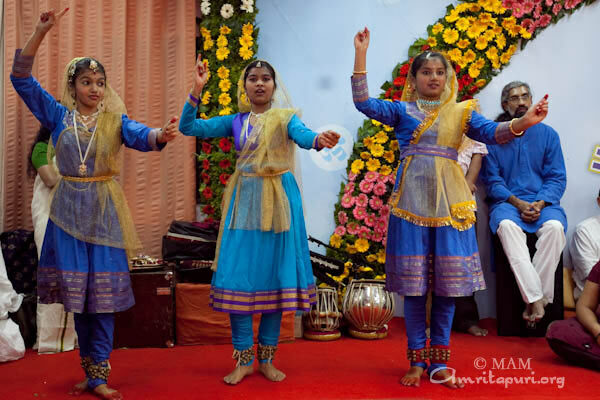 Amrita Vidyalayam children presented different cultural programs, including some traditional Marathi dances. 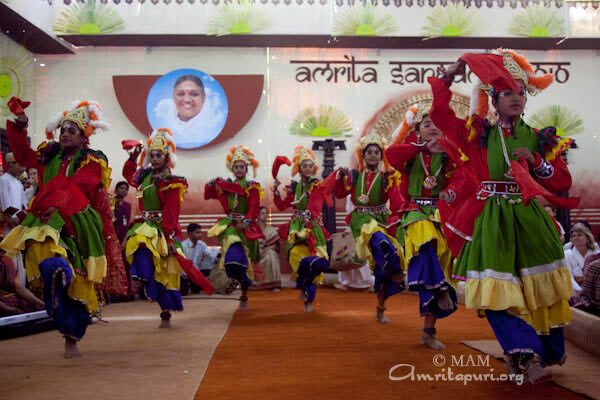 There was a Kathak dance performance by Dr. Nandakishore Kapote, a disciple of Bhrigu Maharaj, a maestro of dance. 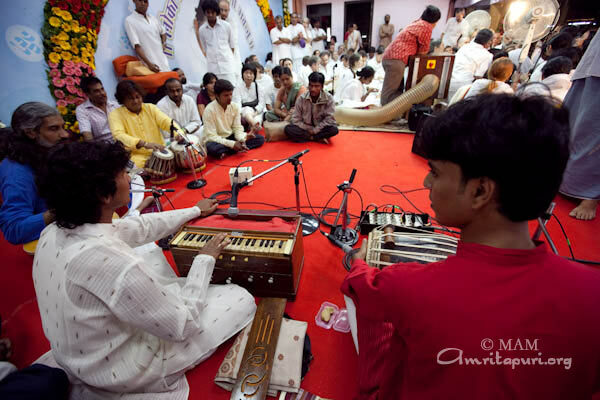 On the first night, there was a wonderful performance by Manish Omano on the slide guitar and Santosh Ghante on the harmonium, accompanied by Sukhad Munde on pakawaj and Santosh Salve on tabla. 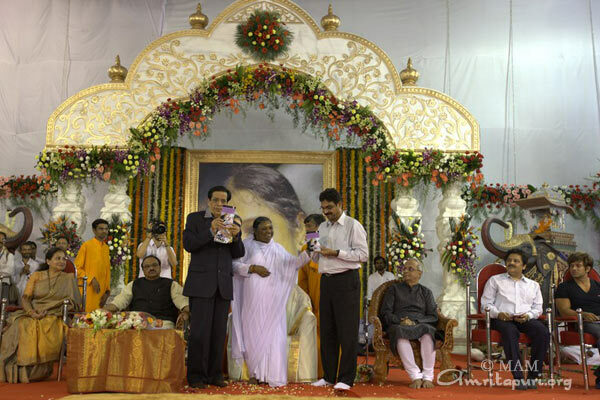 A new biography of Amma written by Raj Lakshmi Deshpande in Marahi titled ‘Jagan Mata’ was released on this occasion. 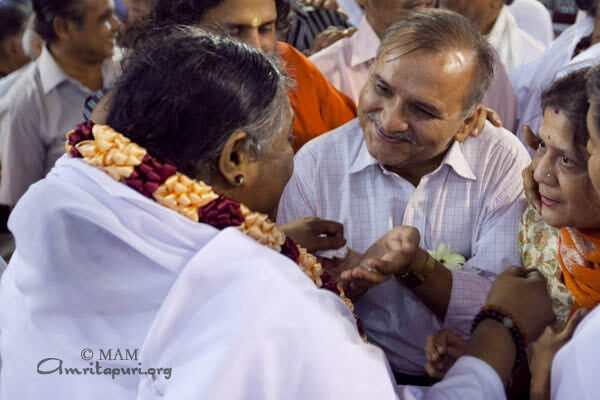 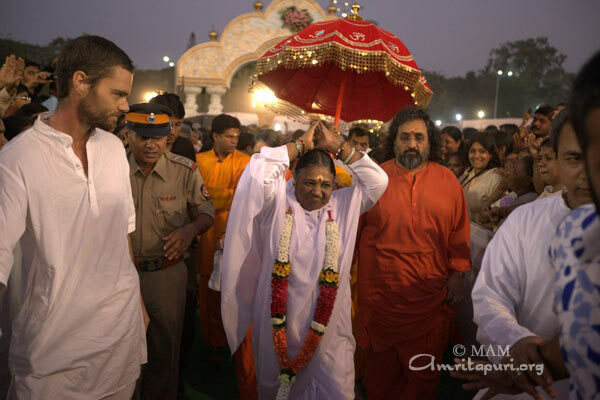 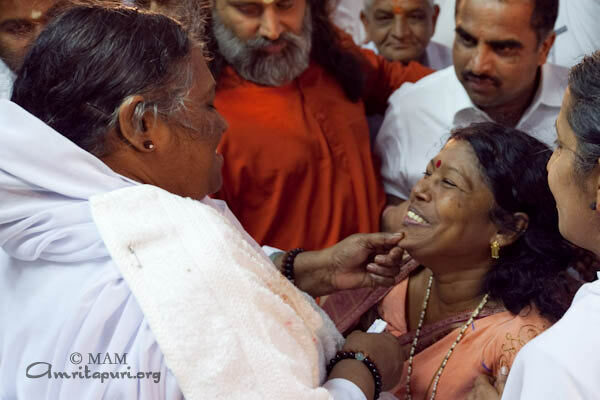 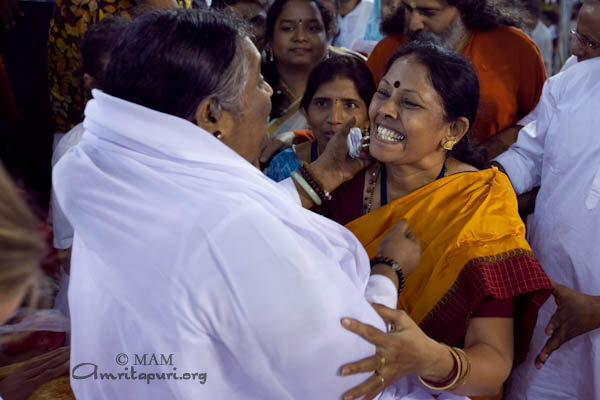 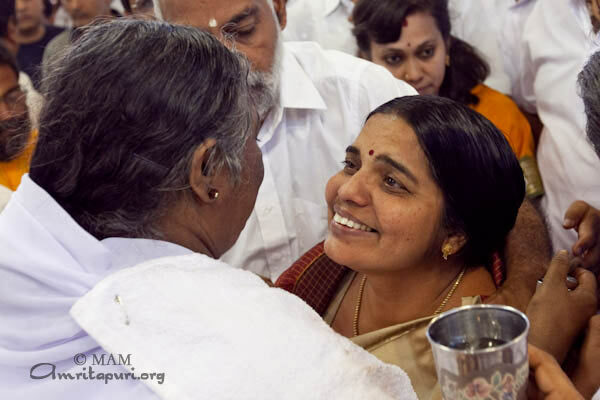 At the end of the last darshan, Amma sang a few Telugu bhajans and Mata Rani upon the request of devotees. 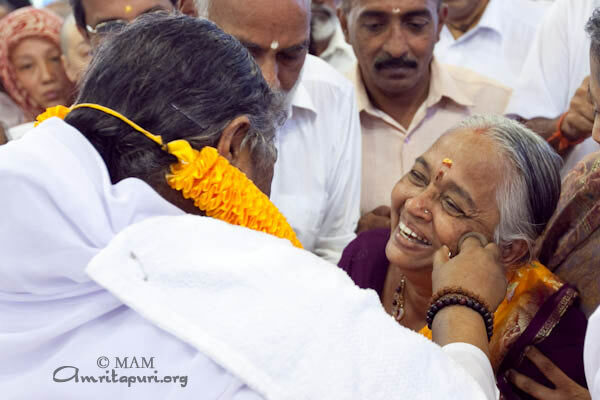 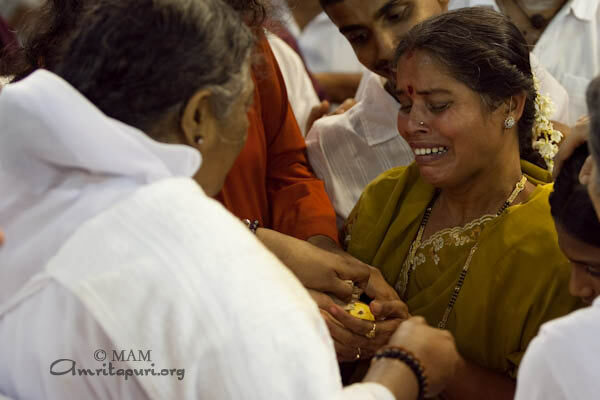 The darshan ended with what has become a Pune tradition…a local family of devotees dressed Amma up as Krishna and implored Amma to reenact some of the leelas of Bala Krishna. 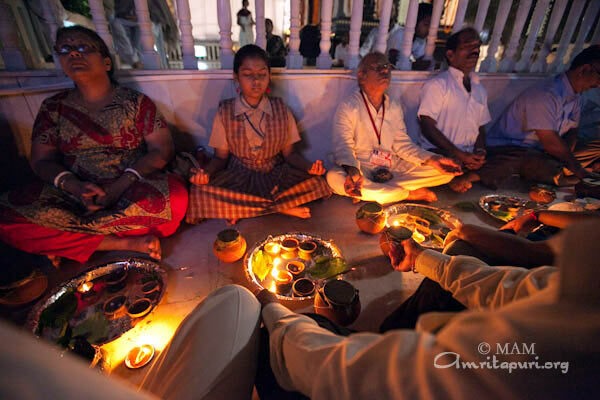 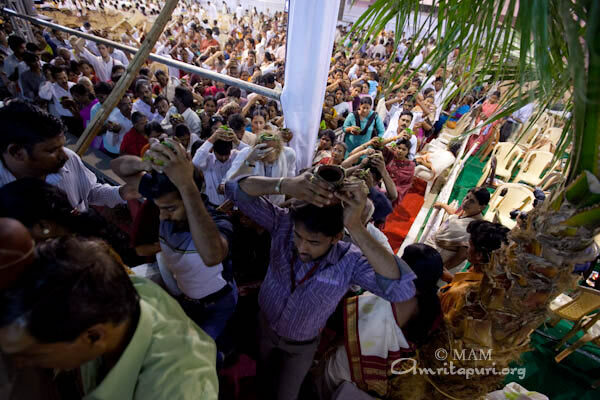 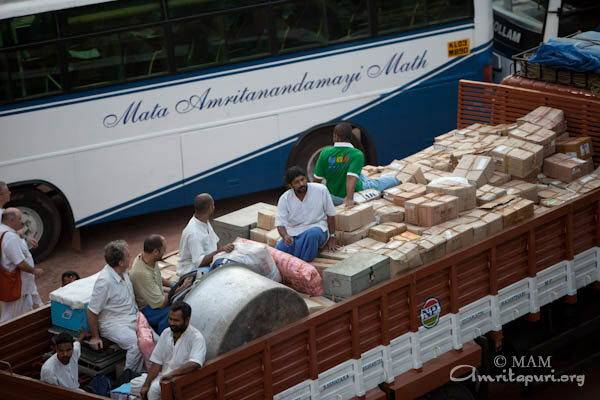 The devotees approached Amma with large mud pots of curd and milk and offered Amma a stick to break the pots. 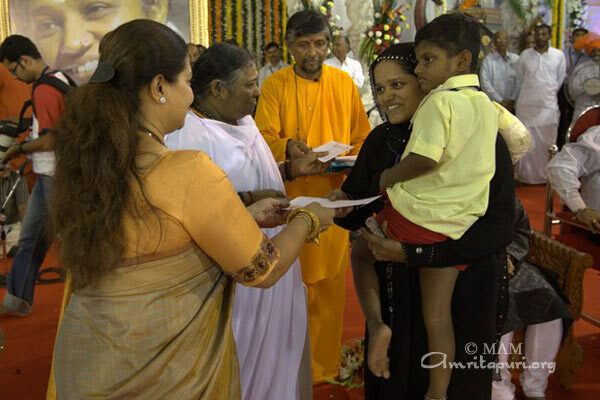 Amma herself then drank from each pot and distributed prasad to everyone. 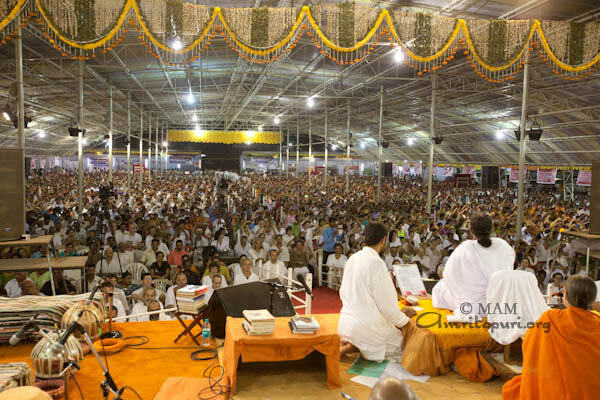 Two days of Brahmasthanam festival programs were held in the ashram in the Mahendra Hills, Secunderabad, Andhra Pradesh. 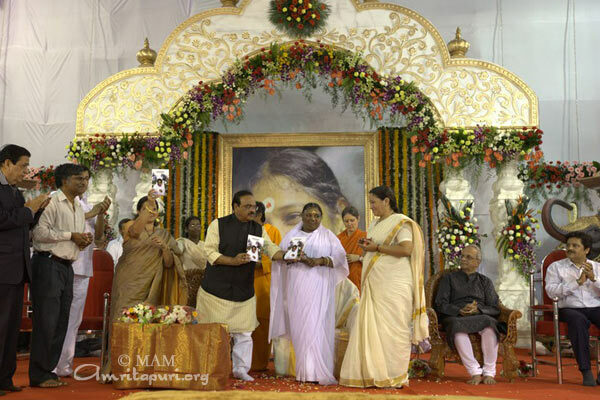 Amma’s satsangs were translated into Telugu, the local language, and touched on many points. 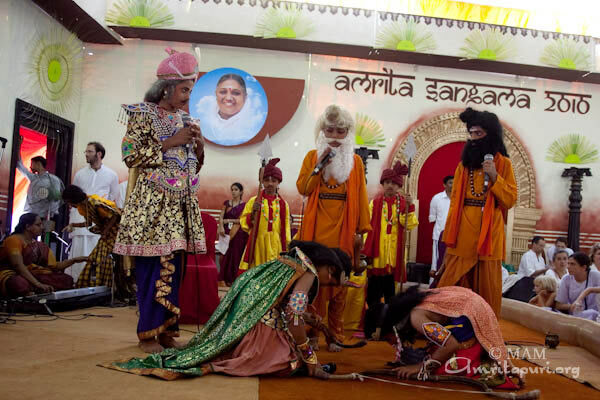 Highlights included the importance of giving and generosity, the value of avoiding intoxicants, and the meaning and worth of self-control. 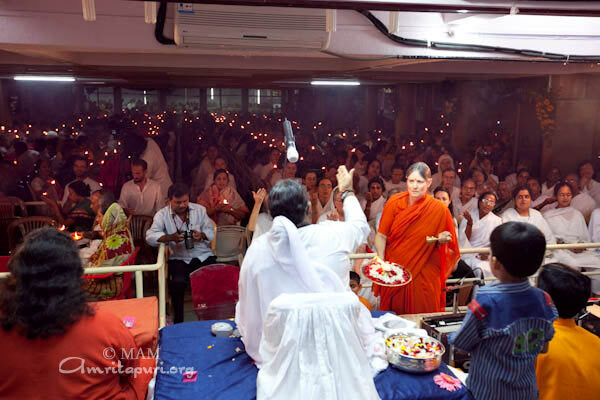 Amma sang many new and old bhajans in the Telugu language and led a manasa puja at each program, speaking in Telugu at the puja. 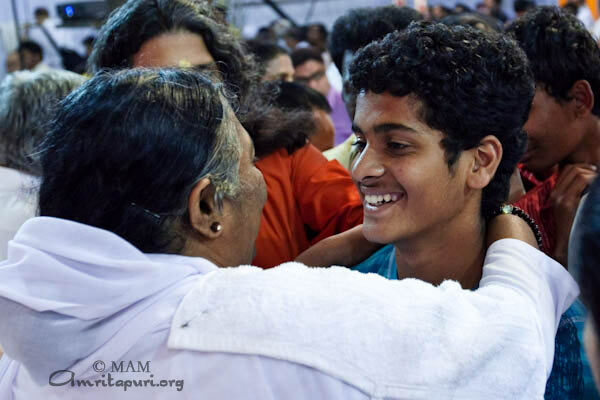 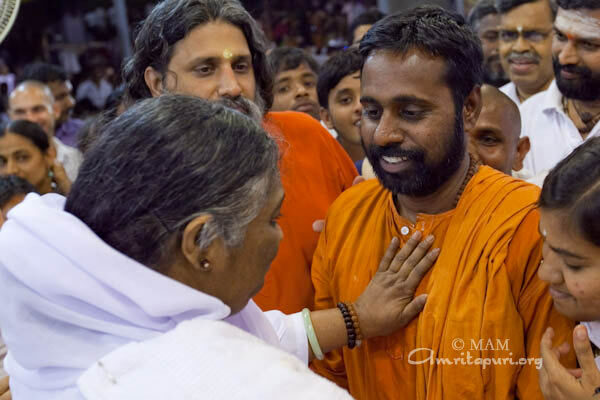 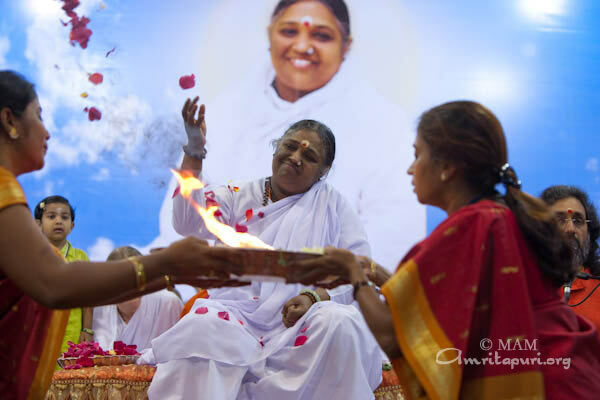 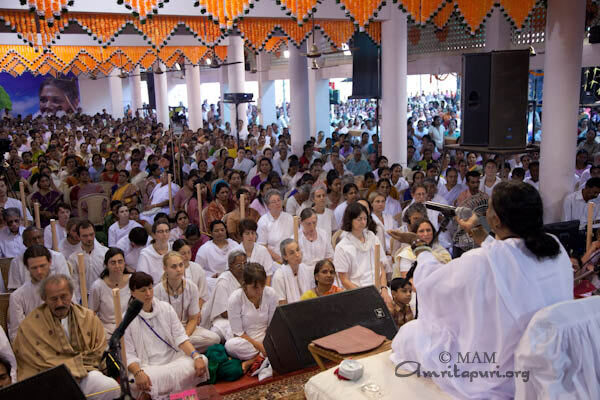 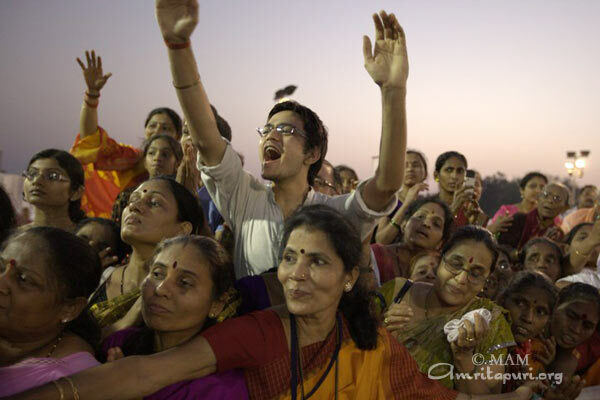 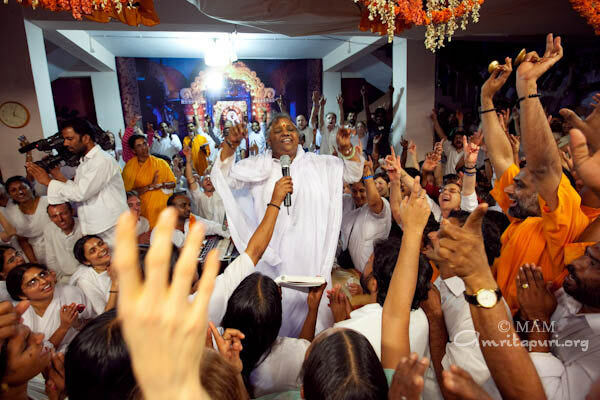 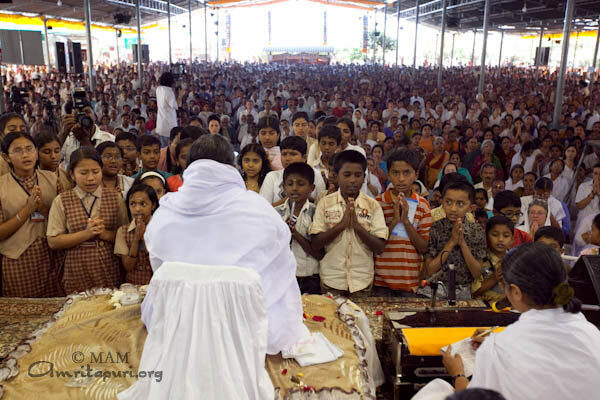 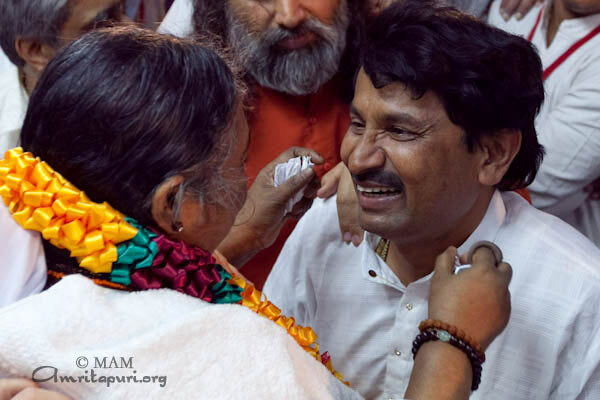 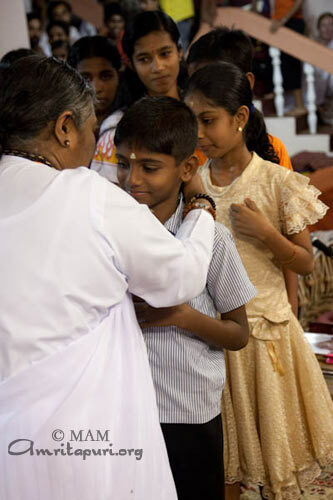 The devotees were thrilled to hear Amma speak their native tongue. 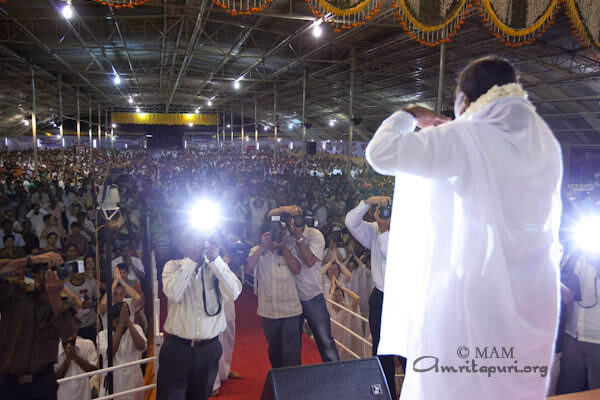 When Amma started to speak in Telugu, there was a roar of applause from the crowd. 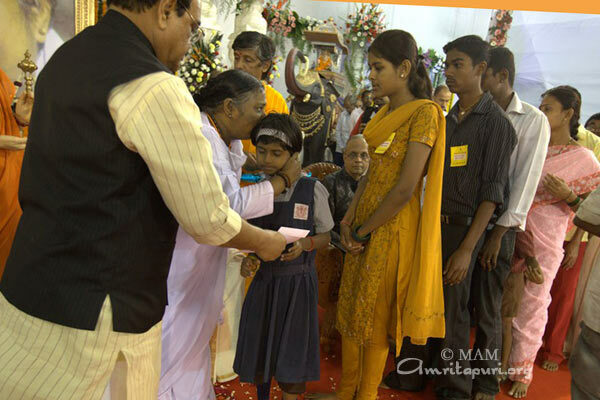 As part of the program, Amma distributed free educational scholarships to five hundred more students under the Vidyamritam free scholarship scheme. 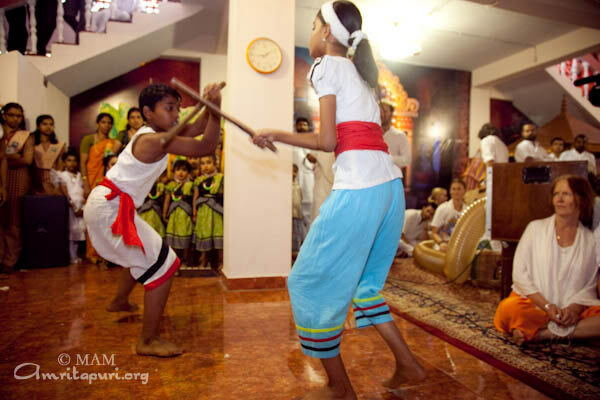 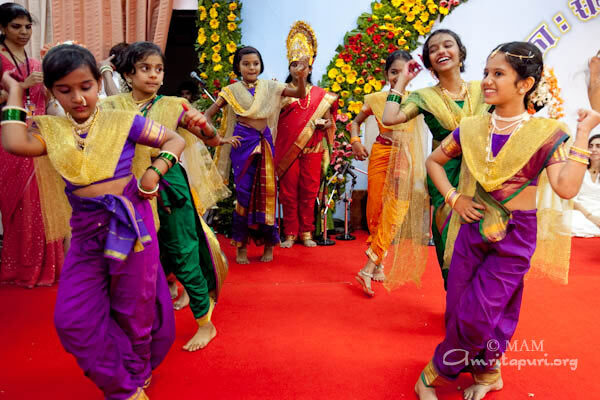 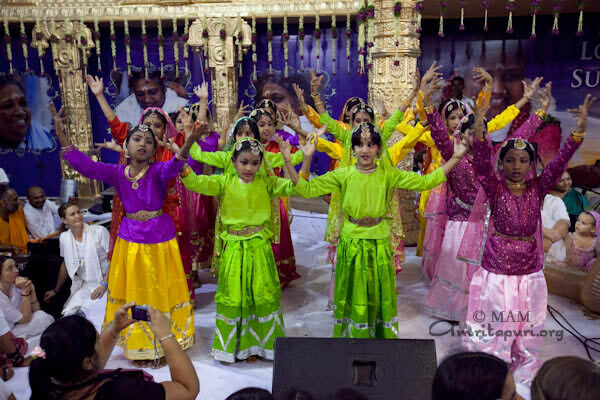 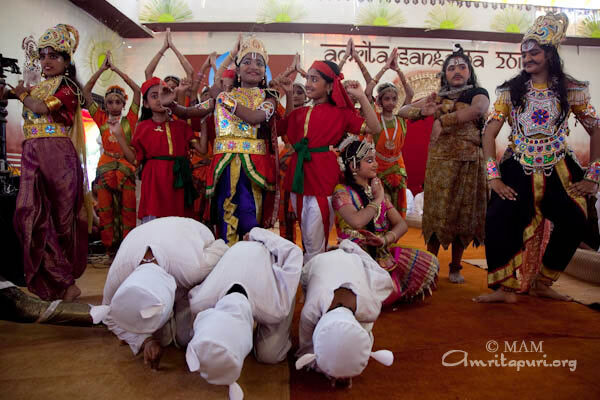 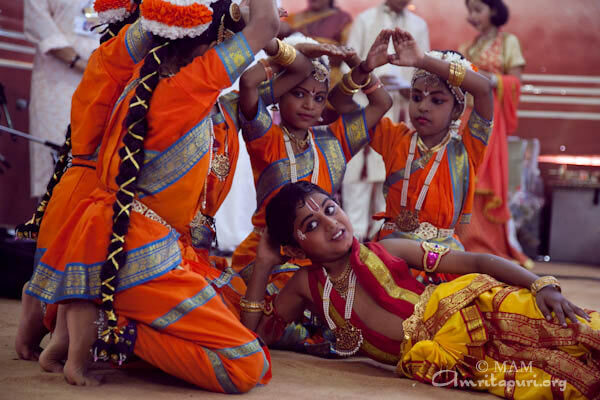 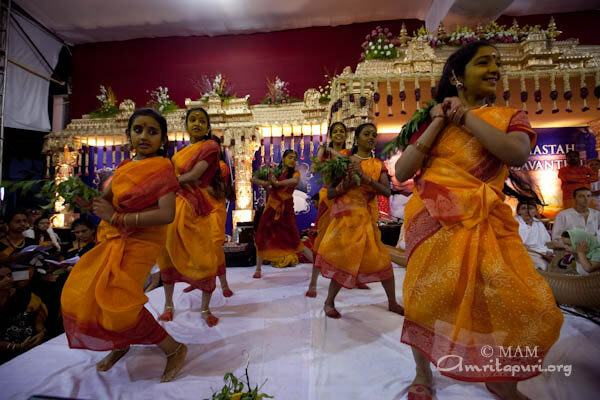 Students of the Amrita Vidyalayam, Hyderabad, performed a drama and danced during Amma’s darshan. 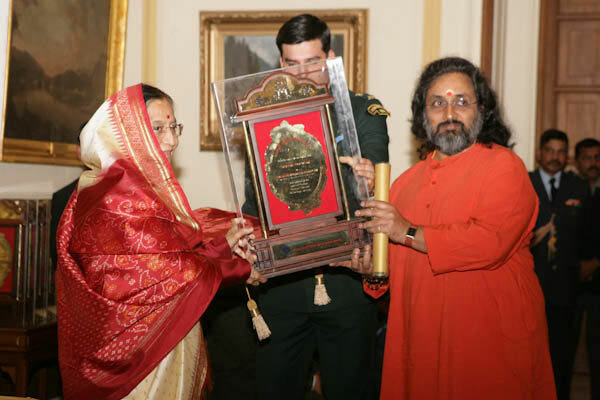 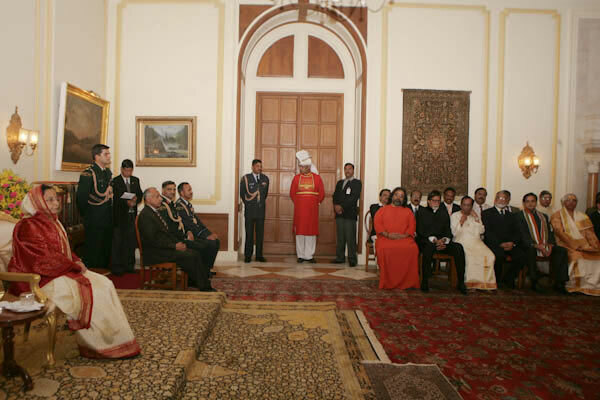 The President of India Mrs. Pratibha Patil presented the ‘Dharama Ghadga’ award to Swami Amritaswarupananda today at Rashtrapati Bhavan. 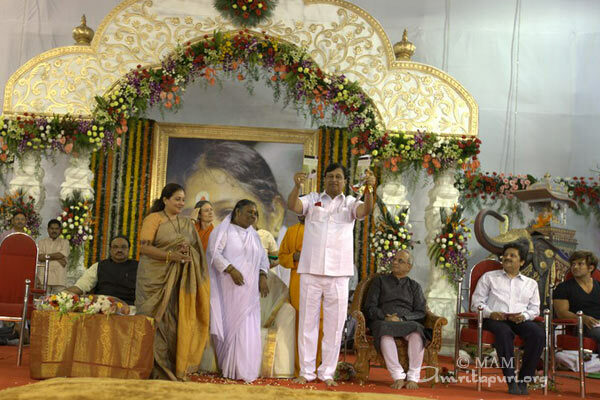 Swamiji accepted the award on behalf of MAM for the charitable activities undertaken by the MATH. 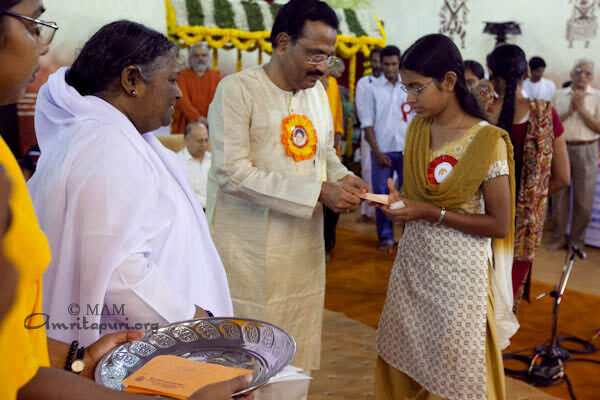 The Pazhassi Raja National Royal Awards are distributed by the Pazhassi Raja Charitable Trust for exceptional contributors to society from all walks of life. 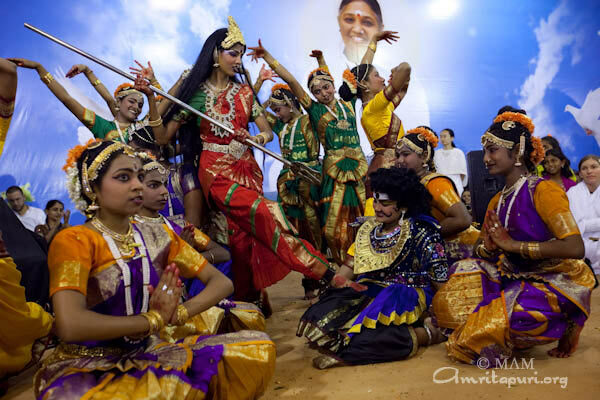 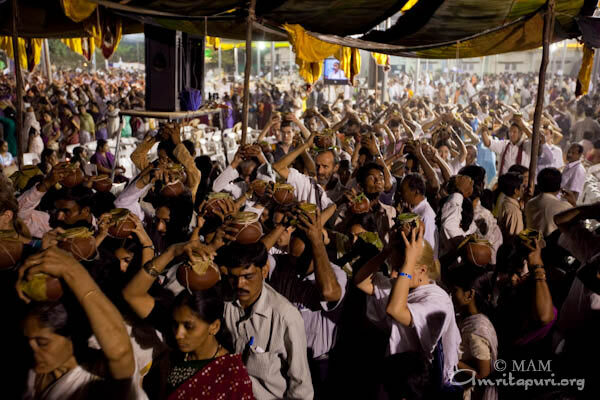 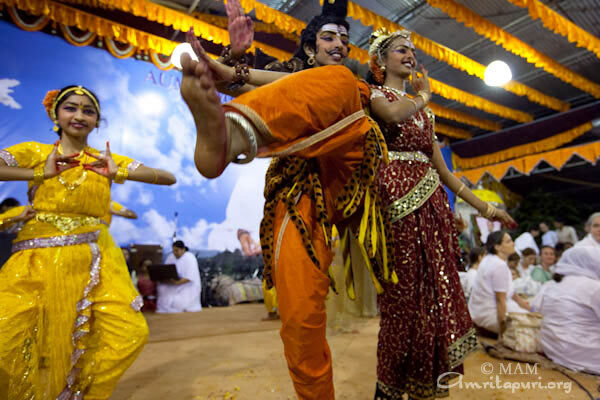 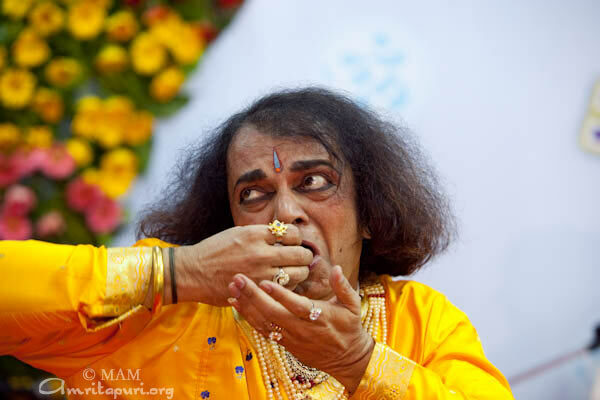 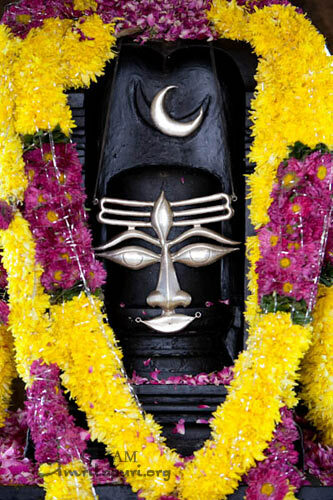 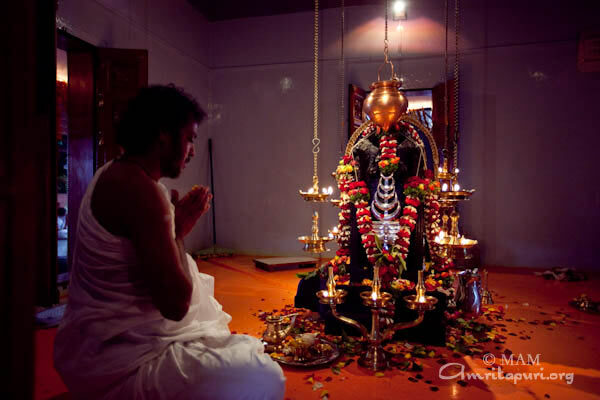 The two day brahmasthanam festival in Bangalore came to an end on Friday morning. 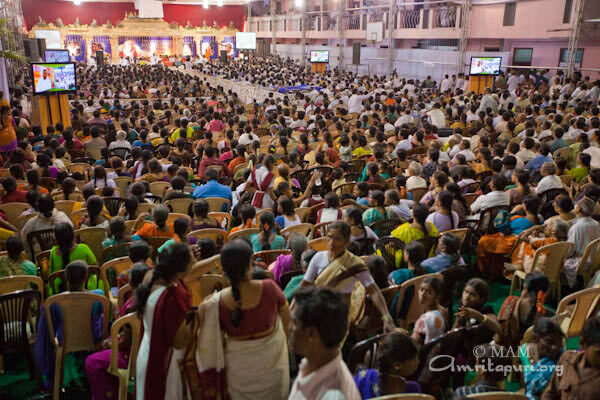 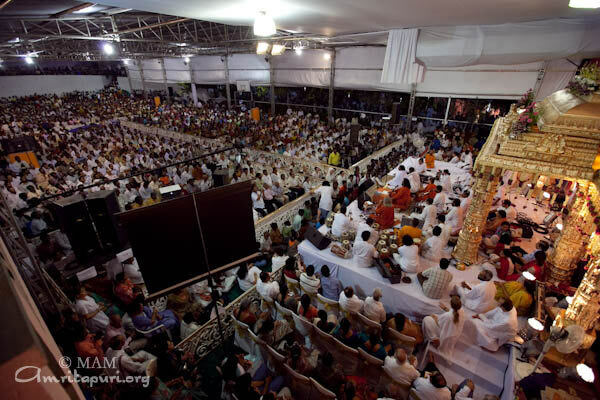 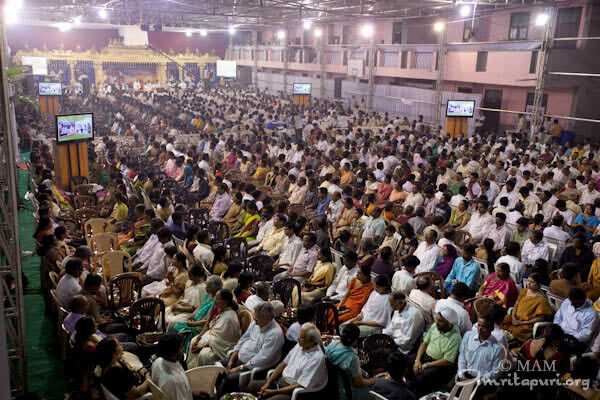 In spite of the programs being held on working days, thousands came for Amma’s darshan in this IT city. 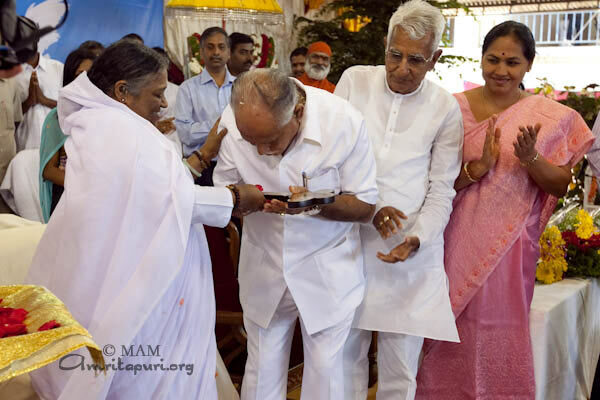 On the first day of the program Amma handed over a symbolic key for 100 houses built for the Karnataka flood victims to the Chief Minister, B.S. 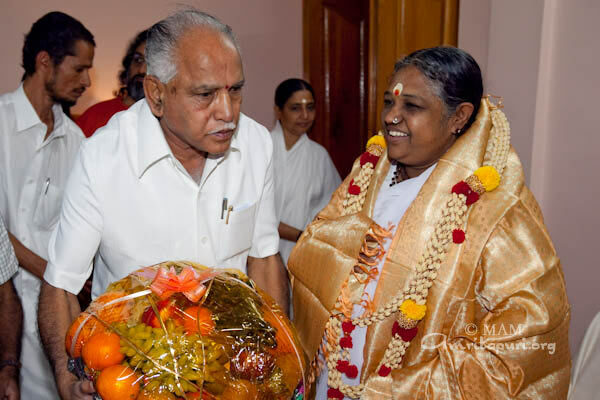 Yeddyurappa. 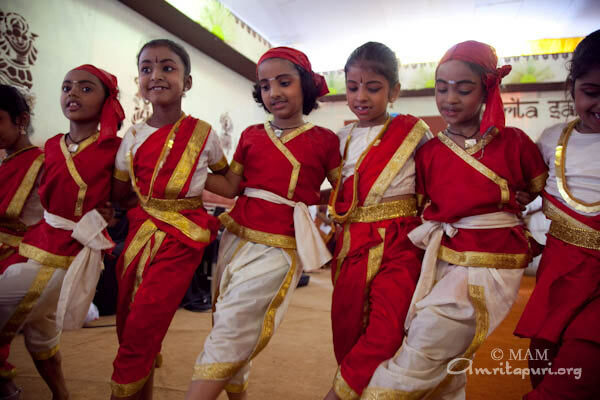 Amrita Vidyalayam children presented the cultural programs on the first day and the Amrita University students on the second day. 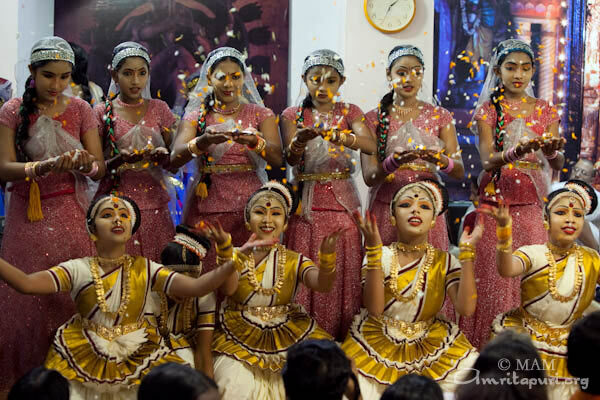 The Amrita Vidyalayam children performed various dances, including some that displayed Karnataka folklore, called ‘Yakshagana.’ The university students enacted a wonderful two-hour musical drama on festivals celebrated in India. 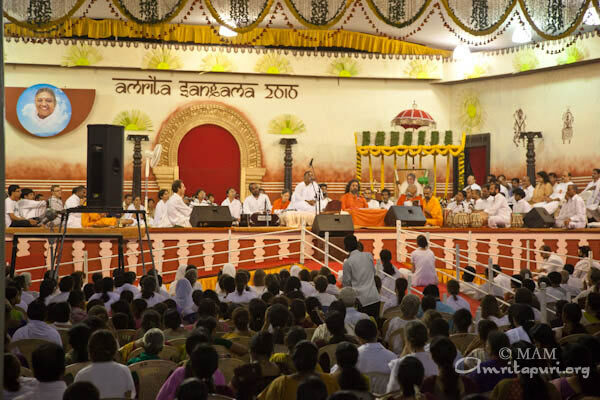 There were numerous newly tuned Kannada bhajans sung by Amma in the programs and she gave instruction for the manasa puja in the Kannada language, much to the delight of the devotees. 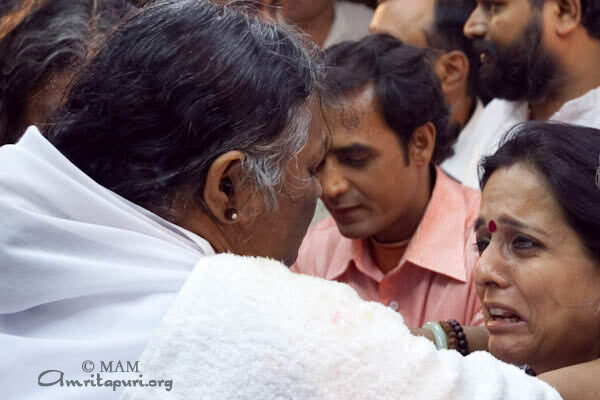 Upon the request of a blind devotee who came for darshan, Amma sang few bhajans in Telugu while she was giving darshan. 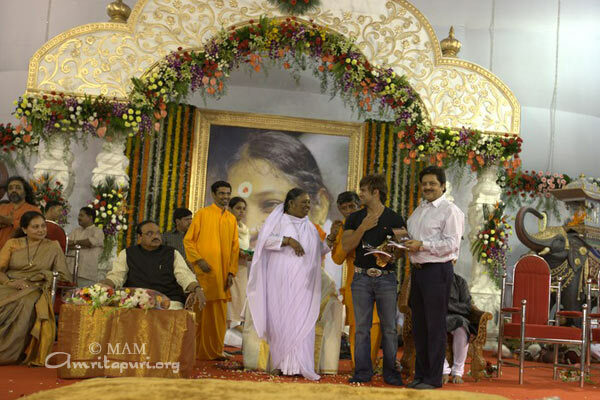 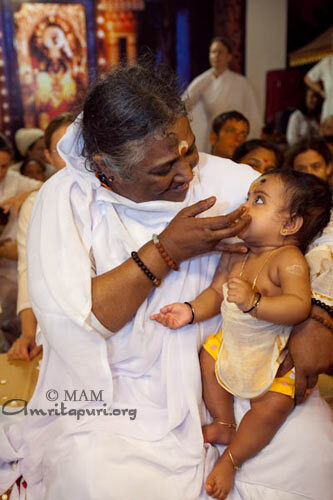 Having showered happiness and love on the children of Bangalore, she will now go on to Hyderabad for the next program. 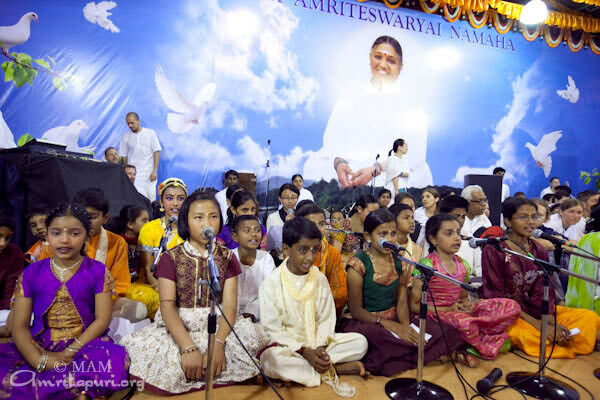 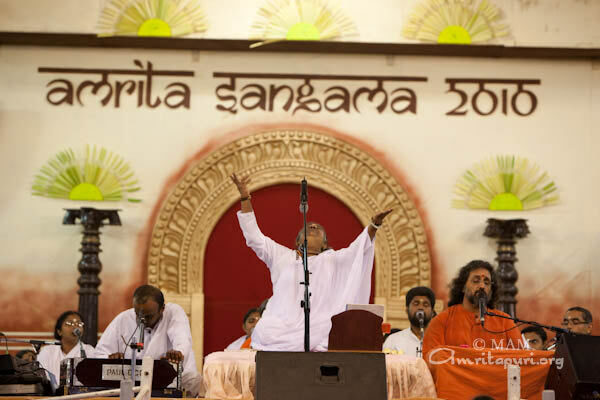 Satsang, bhajans Q&A and meditation. 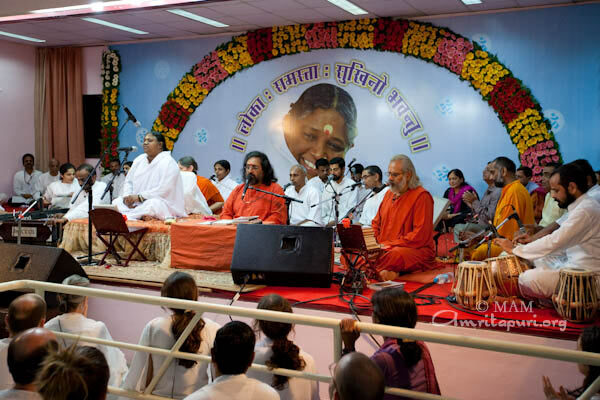 Satsang, Puja, bhajans and meditation. 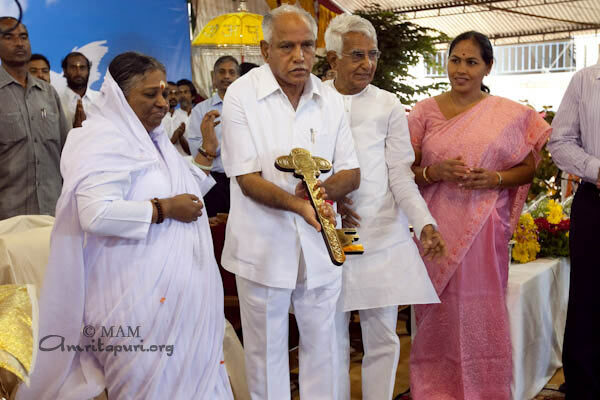 The Chief Minister of Karnataka, BS Yeddyurappa, was on hand today to receive the symbolic key of the first 100 houses built by MAM for the 2009 flood victims. 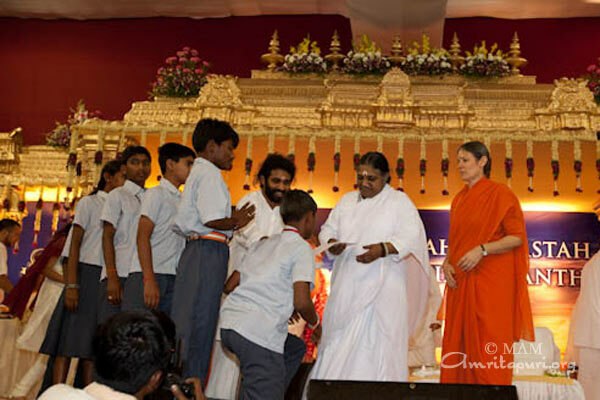 Upon receiving the key from Amma, the Chief Minister in turn handed it over to the deputy commissioner of the Raichur district. 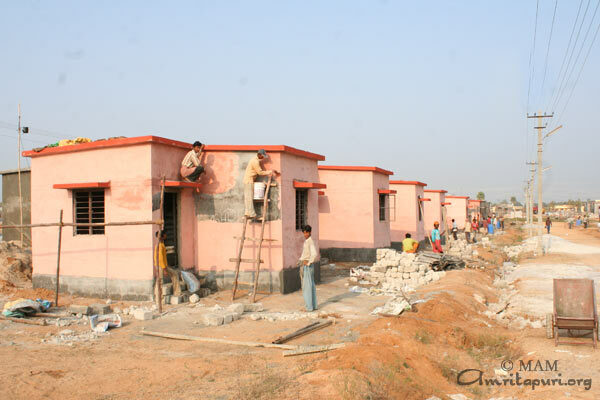 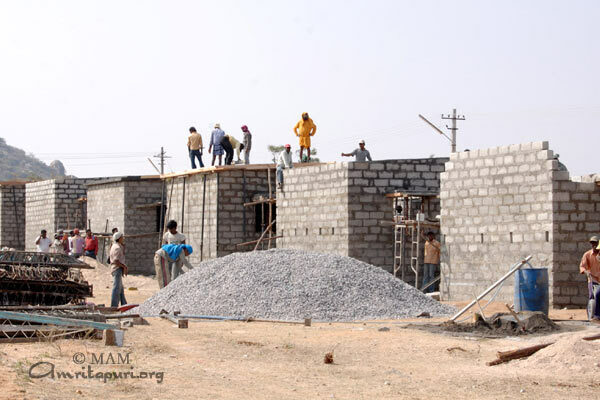 The ashram is planning to build a total of 2000 houses in Karnataka. 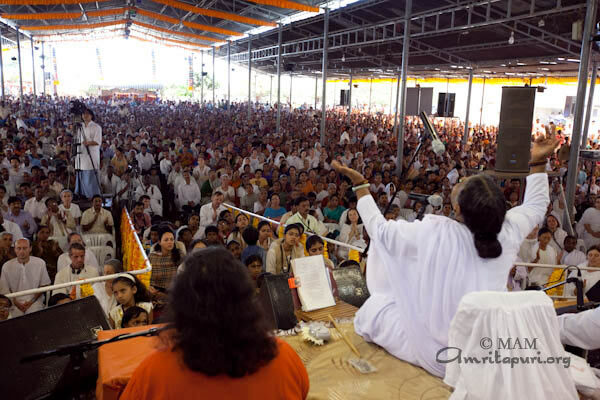 Earlier the Ashram had announced 50 crores for the rehabilitation of the flood affected area. 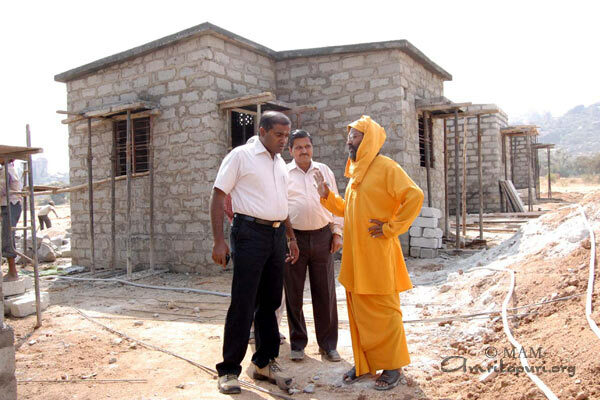 The Chief Minister said that the flood-affected areas have been severely damaged; millions of acres of crops have been destroyed, and more than 100,000 houses have been affected. 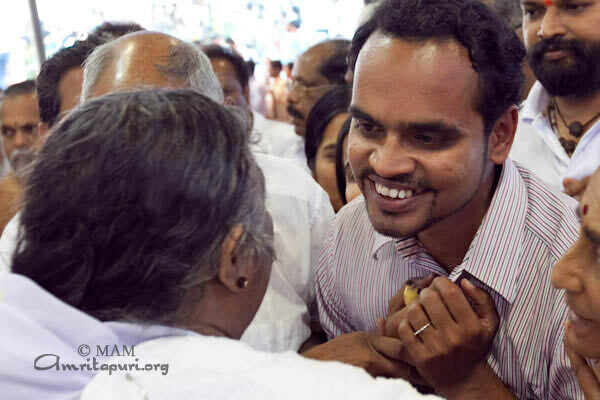 He commended Amma on setting an example of how to react to a crisis and how honored he felt to have the opportunity to meet Amma. 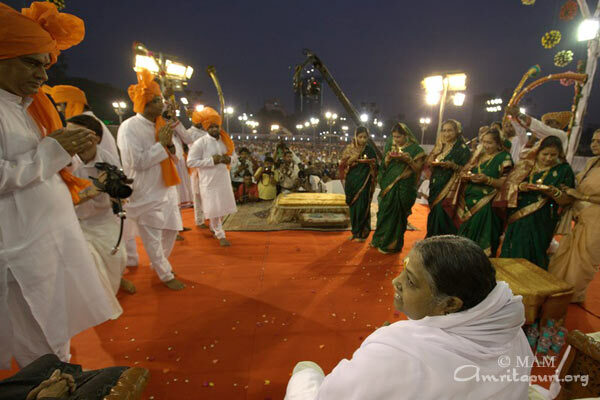 Prior to coming to the stage. 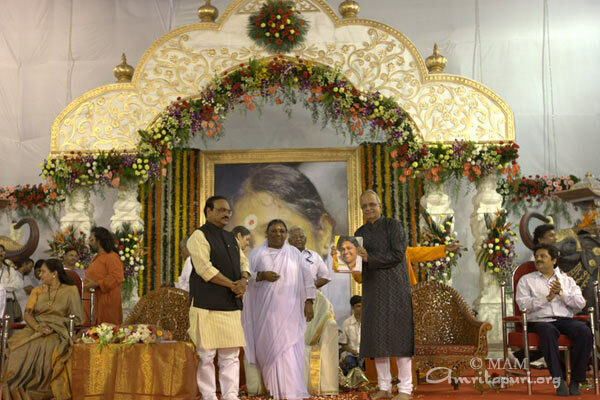 the Chief Minister had an opportunity to meet with Amma privately. 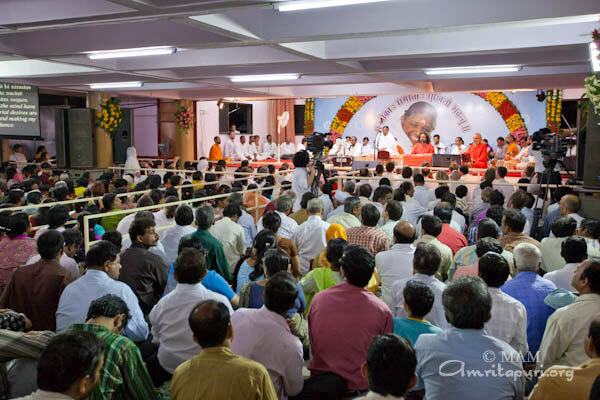 In that meeting the local MLA, Miss Shobha Karandlaje, proposed that Amma set up a multi speciality hospital. 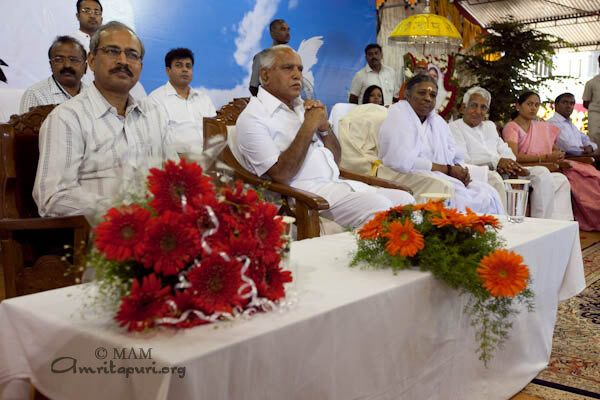 The Chief Minister ended his address by requesting AMMA to visit the flood affected areas and console the affected. 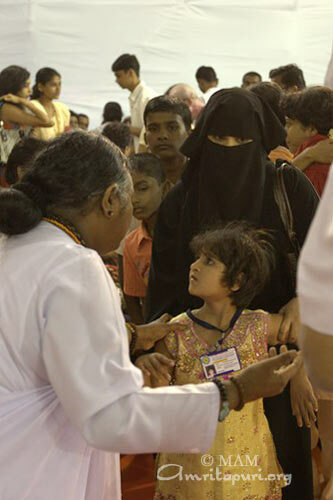 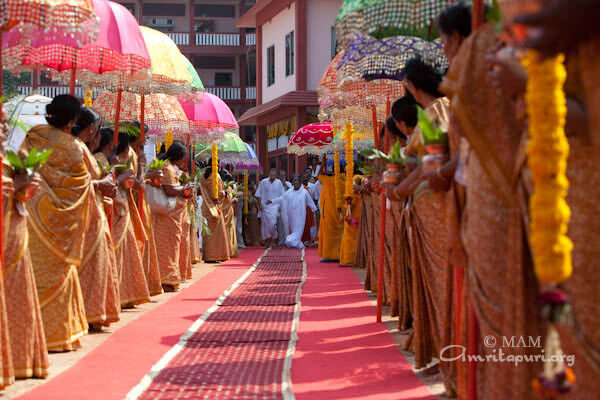 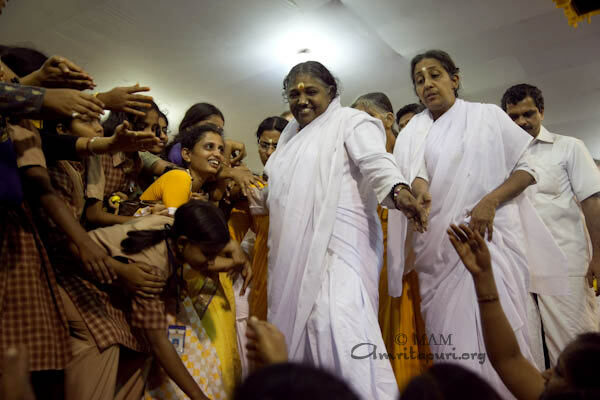 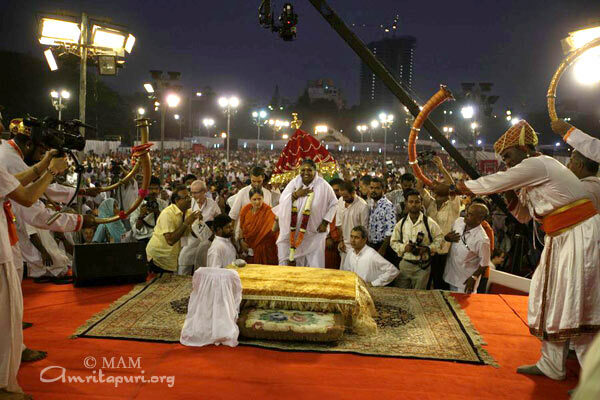 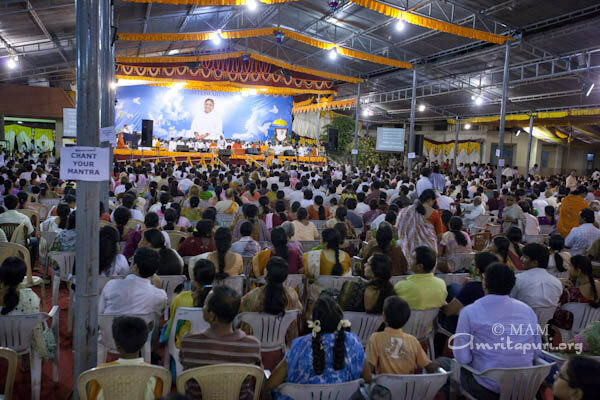 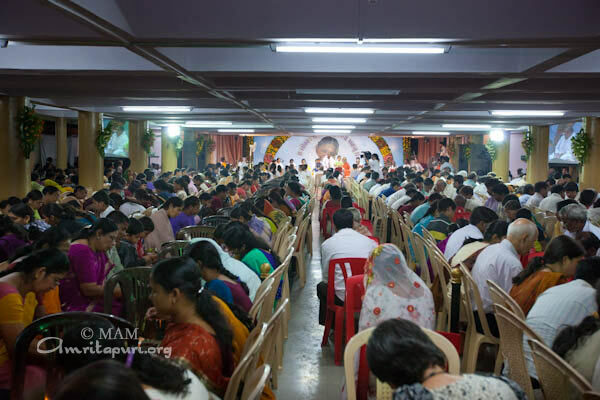 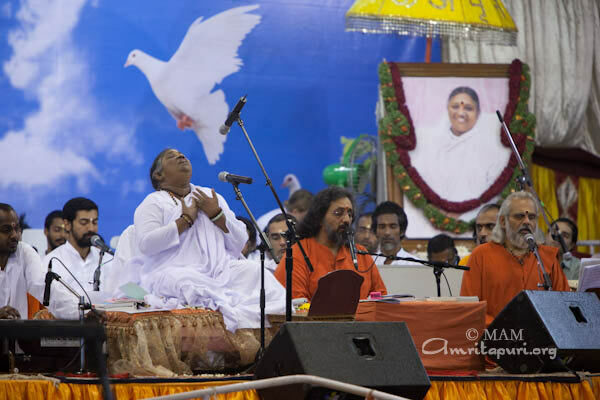 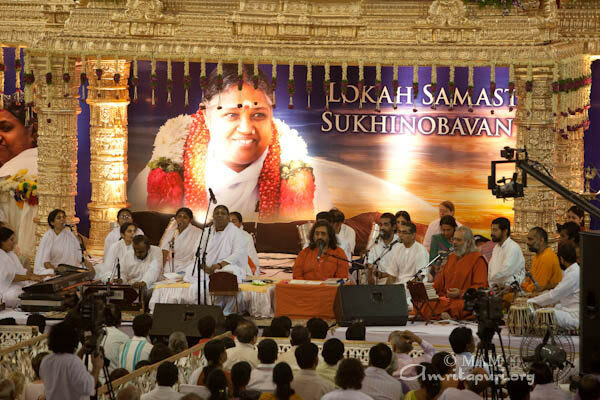 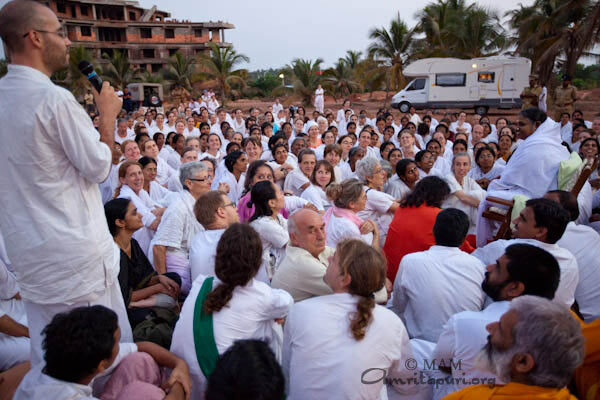 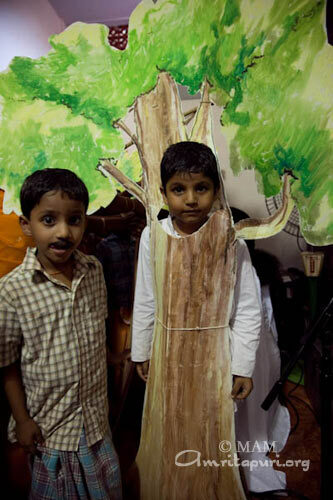 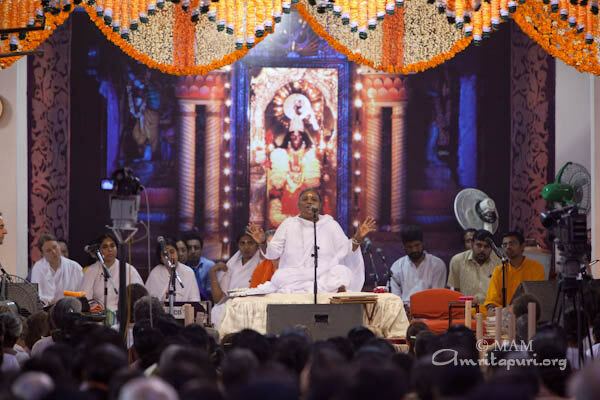 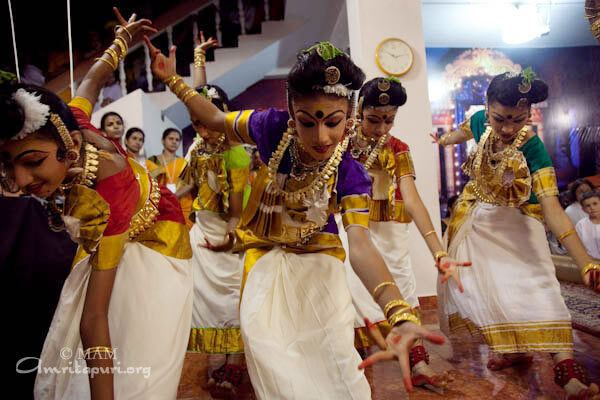 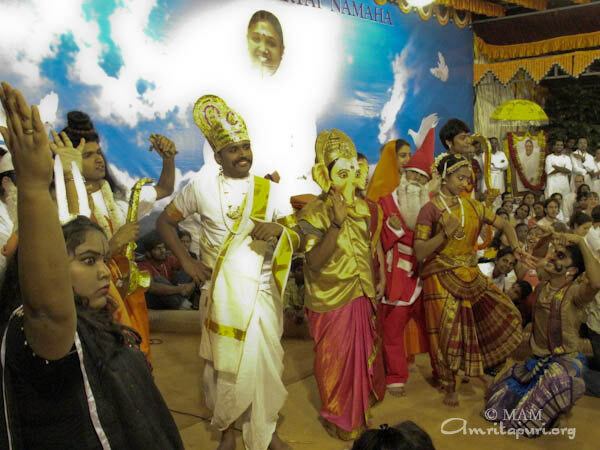 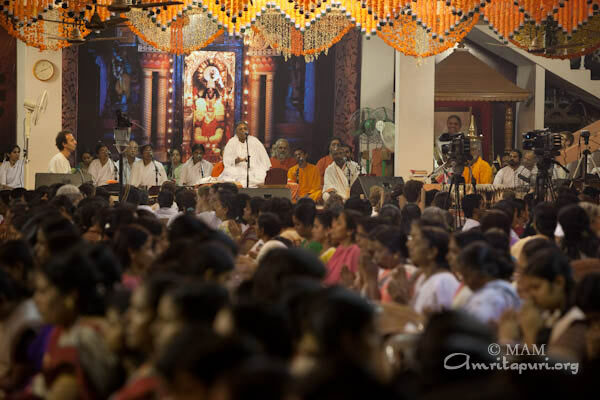 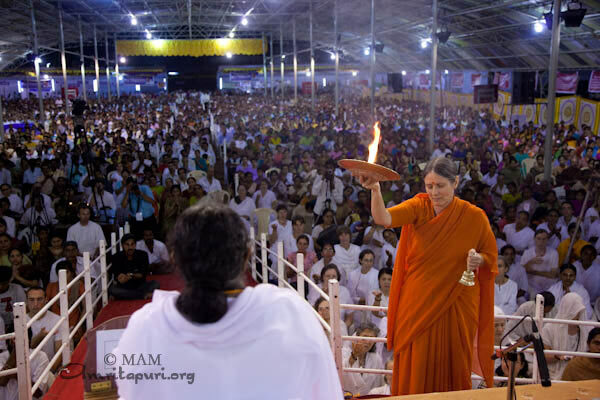 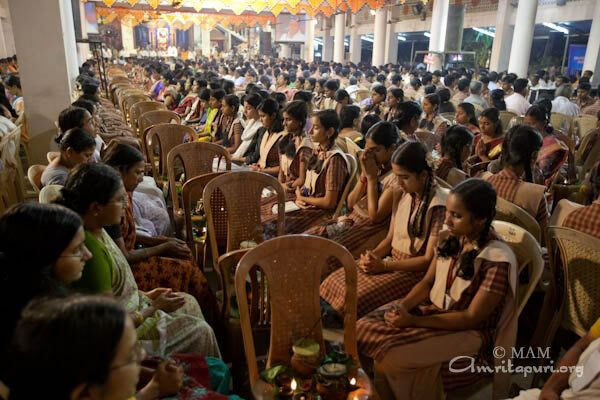 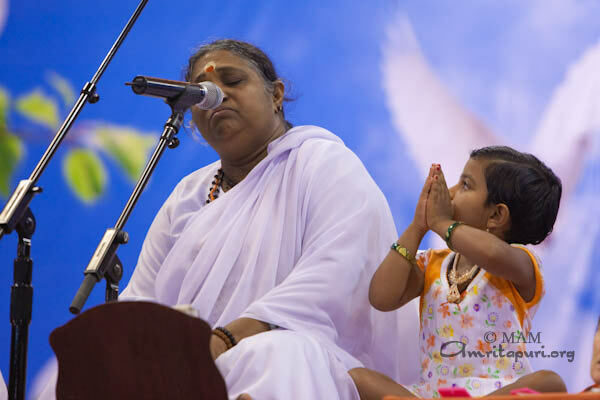 Amma conducted two days of programs in Mangalore as part of the annual brahmasthanam festival. 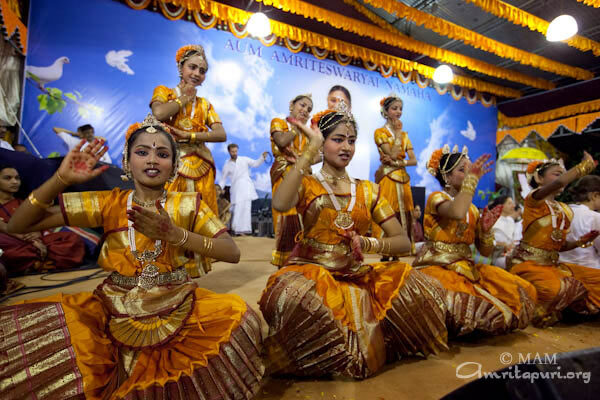 The programs were held on the premises of Amrita Vidyalayam, Mangalore. 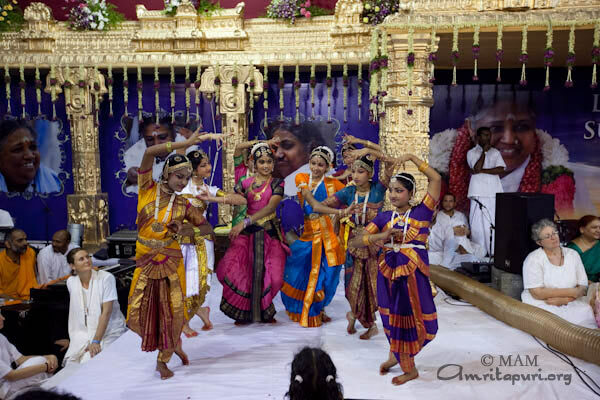 Boys and girls of the school welcomed Amma to the stage, dressed in traditional costumes, playing hand cymbals and waving fans. 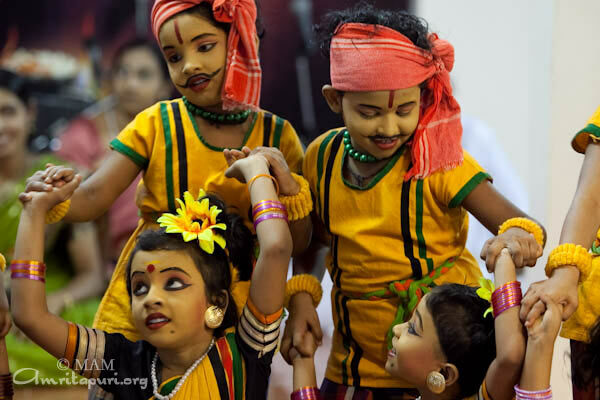 Some of the boys were dressed as tigers, and their dancing created a festive mood. 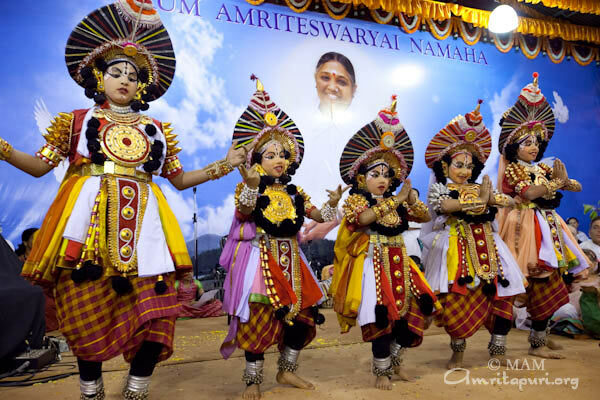 Each time Amma walked to the stage she was greeted by devotees dressed in the different traditional style of ‘Tulu Nadu.’ The stage was beautifully decorated with palm leaves and traditional artform images like Teyyam and Yakshagana. 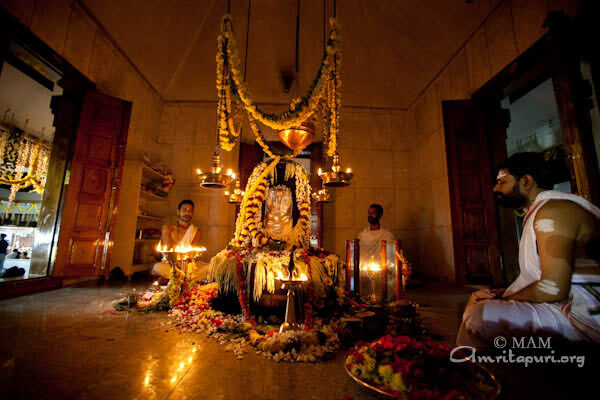 Amma led the manasa puja in the native language, Kannada, much to the delight of the local devotees. 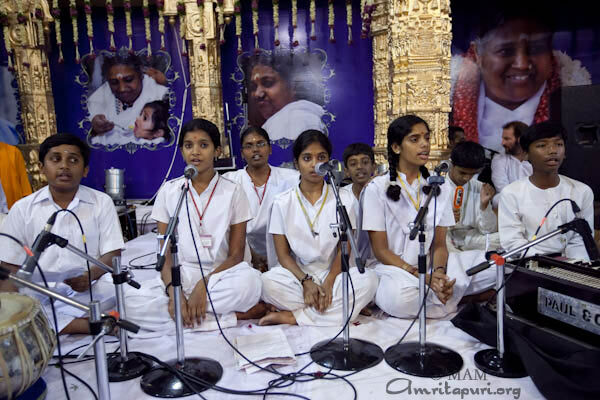 Many new bhajans in Kannada, Konkoni, and Tulu were sung by Amma. 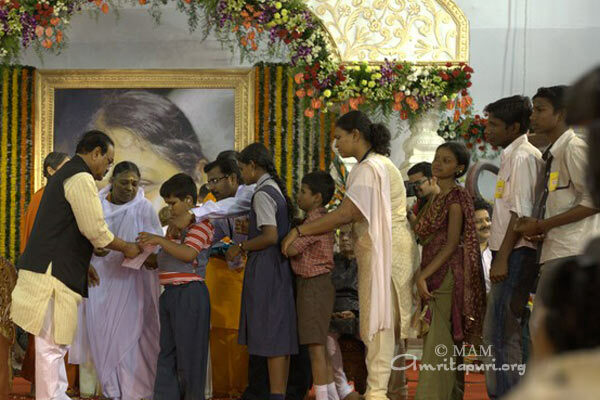 As part of the Amrita SREE self-help group, tailoring machines were given to members of the garmenting unit. 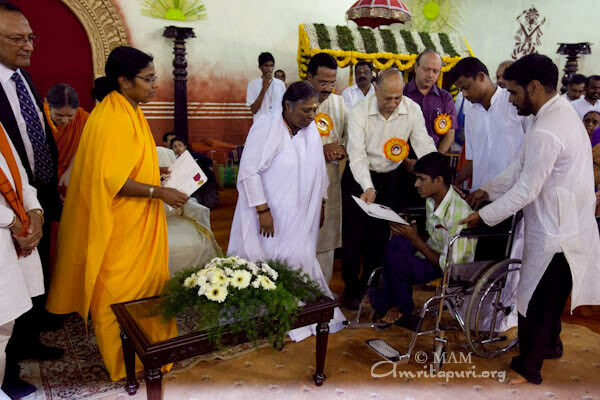 Wheelchairs were also distributed to the physically handicapped. 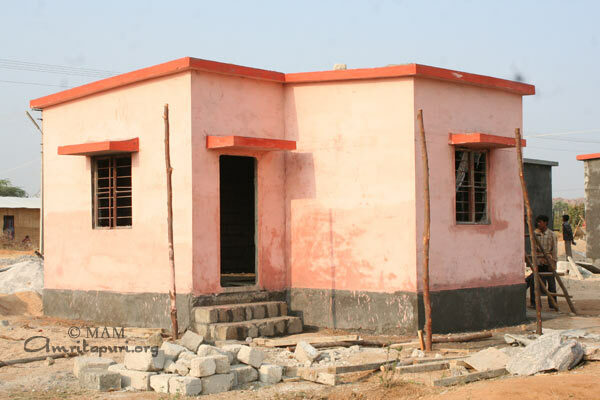 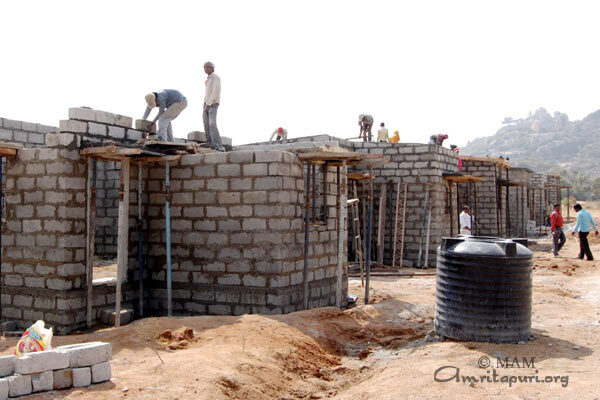 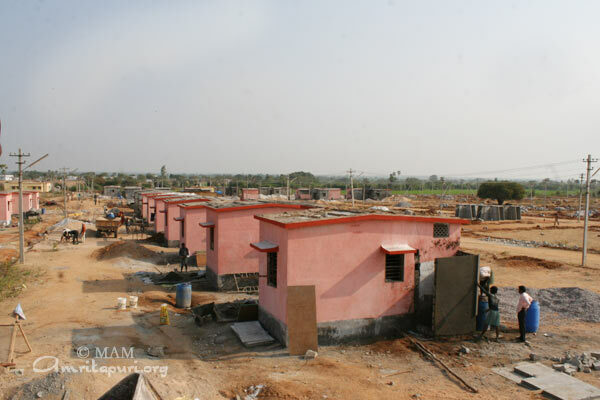 MAM has started the construction of houses in the Raichur District of North Karnataka for the victims of the major flooding that took place there in early October 2009.